dilettante | The cure for boredom is curiosity. There is no cure for curiosity. Santa hasn’t visited for quite a few years now. Not sure whether that is because I’ve ‘grown up’ or I’ve been naughty, but I’m still a kid at heart when it comes to having an advent calendar to anticipate the 25th December. This year, Christmas New Year close down at work is 12 noon 24th December. So my special calendar is also to count the days until the holidays. I often buy a cardboard advent calendar with perforated doors to open to chocolates with a Christmas motif. Last year, because of the heat, the chocolates did not release from the plastic mould in which they were held. So this year, I decided to make my own advent calendar. 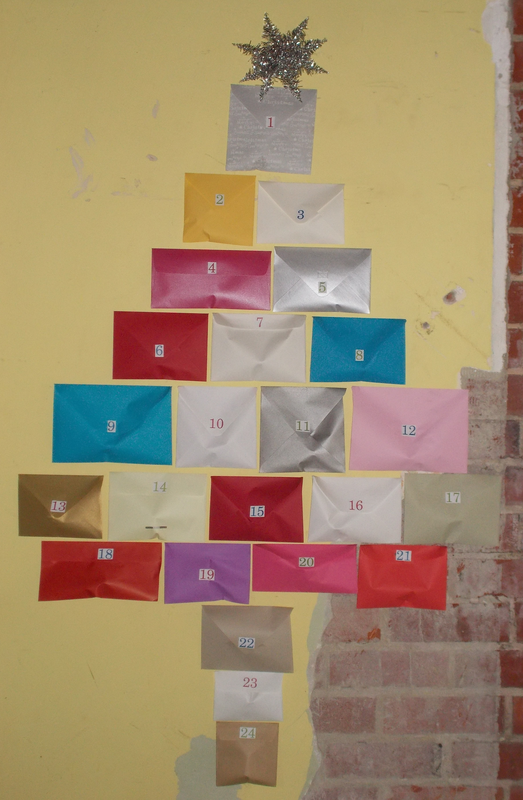 I remembered that I had a collection of envelopes from birthdays and previous Christmas cards, so decided to place these in the shape of a Christmas tree on the wall. The envelopes contain my/our favourite chocolates, that is, milk chocolate Baci, white chocolate Baci, and Guylian chocolate sea shells. The tinsel star is from our box of tree decorations. In hindsight, I perhaps should have chosen some flatter chocolates, but the flat envelopes will help to indicate that a particular day has been reached. I don’t know whether we are going to have similar temperatures to last year, but at least I will be able to lick the chocolate off the foil wrapper this year. The advent calendar has also assisted me to declutter my writing compendium of 24 used envelopes. But now I don’t know whether to continue to collect, or whether I will be able to reuse my reused envelopes. 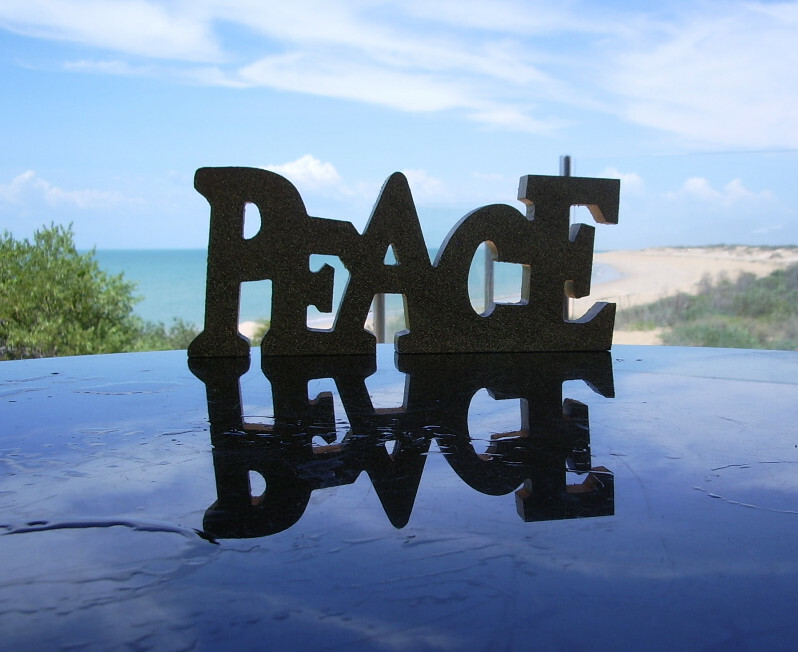 Peace is my form of bliss. All I want for Christmas is more of the same. I ran my first 5K on New Years Day 2014. This was real physical running thanks to the cumulative efforts of the coaches and other members at the BT Run Club. I can’t remember the 5K route that was marked out for the day, but in order to get to 5K, during training sessions I walked and ran to the Causeway Bridge and back. I’m still amazed that I can run, and I certainly recommend the Walk2Run programmes that are offered. I went from walking to running 5K in nine weeks! To keep running is another challenge, but I can say I have been running for over a year now. This type of running has assisted me greatly this year to provide balance in my life that was tipping the scales literally running around everyone else. The commitment to run with the running club and run myself at other times was great for lowering my stress levels and improve my overall mental and physical fitness. I’m telling you this, because I started my blog years ago to let my Mam know what I was doing while she was travelling. My Mam now lives in Naxos, Greece for most of the year so being able to show her my new found fun in a visual way was much more interesting than emailing her a number of how far I had run. 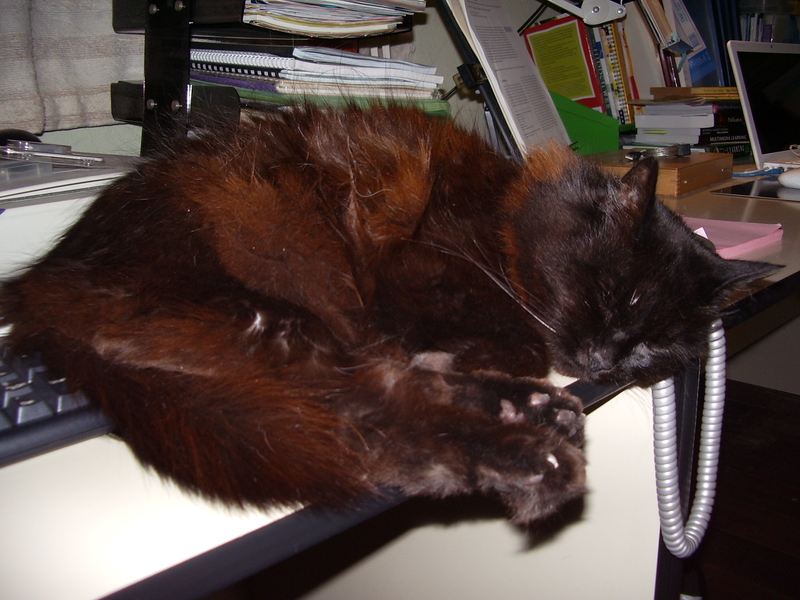 However, other readers finding my blog an perusing what I think to tell my Mam is fun too, so I think I have changed a little about what topics I write about, but I often have my Mam, my special reader in mind. I live a 10 minute walk from a river and 20 minute drive from the sea, but the year before last, we spent Christmas at Eco Beach. 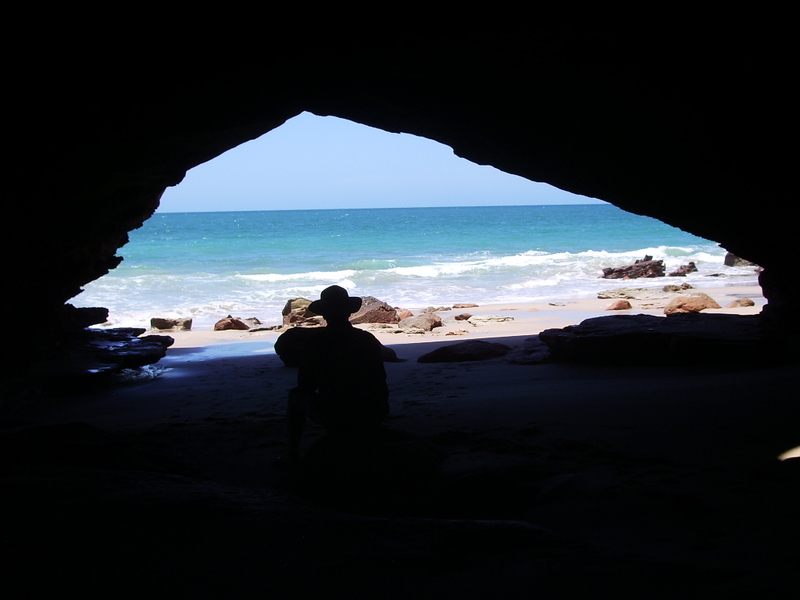 Eco Beach is a 2.5 hour flight from home followed by a 1.5 hour drive from Broome. Australia is known for its wide-open spaces, but to have a bit of beach to yourself, you usually have to travel from the city. Eco Beach is situated only a sand dune away from the beach. Long walks, fishing, kayaking, swimming, and simply sitting contemplating while looking out were how we spent our four days there. The assignment for Blogging 101 today was to follow five new topics in the WordPress.com Reader and five new blogs. This was a daunting task for me as I am interested in so many things. But it was a great experience and I was glad to take up the assignment. You see, I found other bloggers just like me. It was difficult to start writing initially, as I read so many how to blog articles that said that you should write about particular themes and find your niche. Finding other blogs to follow and read that have a different eclectic mix of posts is wonderful. My blog name ‘dilettante’ and tagline ‘The cure for boredom is curiosity. There is no cure for curiosity.’ has been here from inception. Not knowing what I wanted to blog about, I decided to write about what I was learning, interested in, or discovering at the time. I have an insatiable curiosity and love of learning. Which is why I thought of ‘dilettante’. I wouldn’t say that I dabble, as I take my pursuit of curiosity very seriously, but once I’ve ‘figured something out’, I’m ready to move on to the next step in life-long learning. However, the crossover of art and science I find is the most intriguing. The tagline was found in an email sig, and I thought that it was attributed to Dorothy Parker. But now I don’t know whether it was Ellen Parr and or Eleanor Roosevelt. Not sure how to find the definitive answer to that one. I’m still happy to be a dilettante and my curiosity is still somewhat insatiable. I particularly avoid busy streets and fortunately able to do this as I live and work where I am not in heavy road traffic and crowded streets. The esplanade has a shared path and pedestrian path on either side of the road. I used to cycle on the road, but since last week I have been cycling on the shared path. Not as smooth as the road, but less likely that I am going to have a four-wheel drive head-on my side of the road! 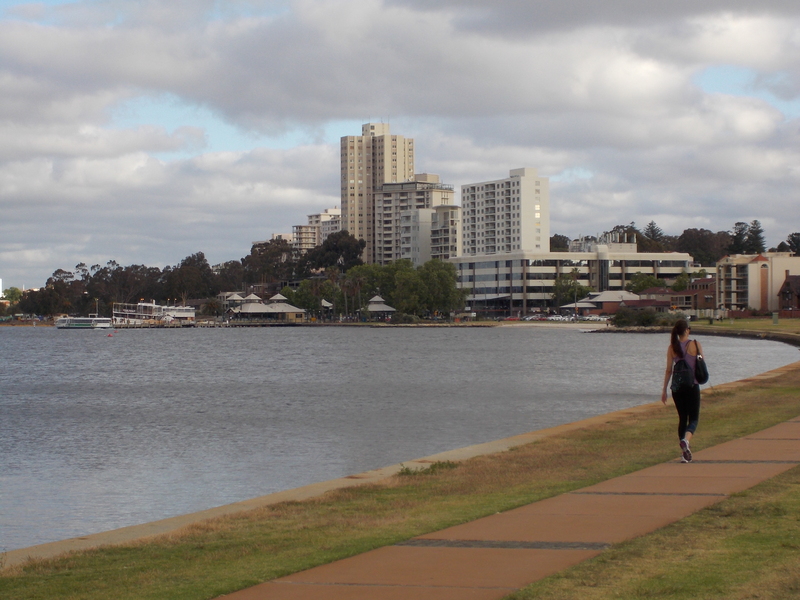 The woman is walking towards Mends Street, South Perth, the bottom of which the ferry comes in from across the river from the city. This is the path that I sometimes run along. Insatiable curiosity and delight in learning new things, such that I am a committed dilettante. 1. a person who takes up an art, activity, or subject merely for amusement, esp. in a desultory or superficial way; dabbler. 2. a lover of an art or science. From Italian dilettante, prop. present participle of dilettare (“to delight”), from Latin dēlectāre (“to delight”).